NBC has canceled "Community" after five seasons. The quirky cult-favorite comedy was axed by the network Thursday, cutting short fans' dreams of "six seasons and a movie" (five seasons and no movie just doesn't have the same ring to it). "Community," which has long struggled in the ratings, saw the return of series creator Dan Harmon this season but also the departure of original cast member Donald Glover. The fifth season averaged 3.7 million viewers and a 1.6 rating among adults 18-49, including DVR playback, according to The Hollywood Reporter. Harmon and series co-stars Joel McHale, Jim Rash and Gillian Jacobs was among those who took to Twitter to mourn the show's cancellation. Too much love 4 @joelmchale @GillianJacobs @YNB @alisonbrie @kenjeong @dannypudi @DonaldGlover & entire Greendale extended family & crew. A most heartfelt THANK YOU to all the Community fans. I LOVE YOU SO MUCH. My life is so blessed because you're all in it. Chang The World. "I hope that there's another season," Rash had told CBS News last month. "I think it's always nice when a show knows that this is it, so you can plan for that and sort of structure it how you want the world to come to an end. In a perfect world, six seasons and a movie feels exactly right for a show like 'Community.'" 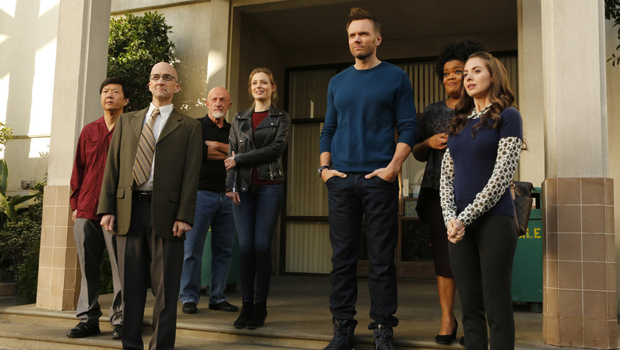 There's a possibility the show isn't dead for good -- reports say Sony Pictures TV, which produces "Community," will try to find a home for the show on another network. In other cancellation news, NBC also pulled the plug on "Revolution," "Believe," "Crisis" and the comedy "Growing Up Fisher," while renewing "Hannibal," "About a Boy," "Law & Order: SVU," "Grimm," "The Blacklist," "Chicago Fire" and "Chicago PD."